November, 2004; photos scanned from prints. 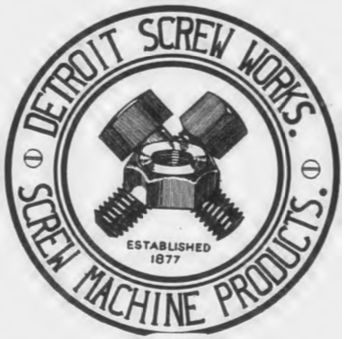 The Detroit Screw Works was established in 1877 as a partnership between F.W. Clarkson, G.G. Clarkson, and H.H. Taylor, and was incorporated as the "Detroit Machine Screw Works" in a plant at 68-70 Champagne Street (that of course is the old pre-1920 Census numbering, and Champagne is now E. Lafayette). The company stayed at this site until 1892, at which time they expanded into a three story building at the present location of Atwater & Riopelle. In 1894 the company name was shortened to "Detroit Screw Works," and it was soon again necessary to expand their facilities. In 1905 they erected another building at that site, a three-story reinforced concrete structure, which they added another three stories onto in 1907. In 1900, according to Burton the Standard Screw Co. "took over the Detroit plant and headquarters have since been maintained in New York City"; 600 were employed in this plant at the time. The products of this plant in those days included screws, bolts, or nuts from 1/16" to 4-1/4" size, of steel, brass, bronze, or aluminum. The Detroit Screw Works handled trade in this business to Michigan, Ohio, and Indiana, but 70% of its output was sold in Detroit and its suburbs. Undoubtedly a portion of their products went directly into the Detroit shipbuilding industry, since this plant was essentially located next to its epicenter. As early as autumn of 1914, Detroit Screw Works began turning out materiel for the allies in WWI including fuse parts, projectiles, and rifle bullets. Later when the U.S. joined the fray, shrapnel and high-explosive fuses were added to the production list. In 1958-59, the Mult-A-Frame Division of the Ainsworth Manufacturing Corp. was listed at this address, 1471 Atwater. Ainsworth produced automobile parts from 1920 to 1957 in their plant nearby at 2200 Franklin. This building was most recently used as the Industrial Public Warehouse. For some reason there were a lot of wrecked cars up in the building. Not sure if this used to be a chop-shop Mecca or if it was just because the last tenants worked on cars. Of course, Medusa Cement was demolished not long afterward. The Atwater District was so barren in the early-to-mid-2000s that it felt like a movie set. Today (in the late 2010s) it is gentrifying, with even new condo buildings springing up out of nowhere. Much of its character derives from the fact that it is such a complete collection of Victorian-era industrial buildings that it seems as though it should be a movie set. The view from the roof was very good. In fact this was a very popular spot for fireworks viewing until it was torn down. The screw works was also very popular with skateboarders, as some of them had set up ramps on one of the floors. 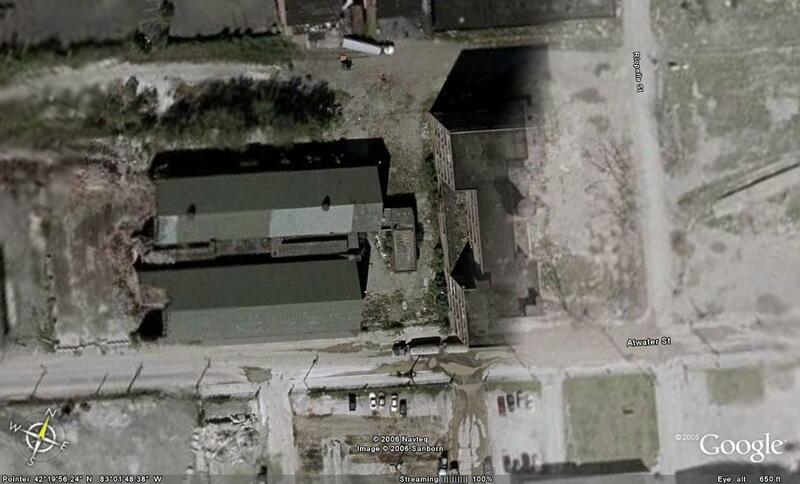 I love these mill-style factories, especially this particular one as you can see where a different section was torn down, and the wall there is entirely brick, instead of sqaures.